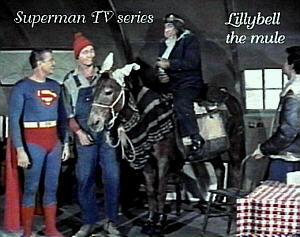 More famous horses - movie horses - tv horses - trick horses - stunt horses. A variety of equine pictures and information concerning the horses, mules donkeys and burros through the years. Some awards too. 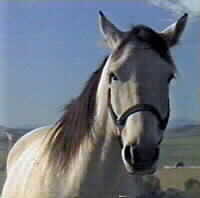 series used a horse, trained by Ralph McCutcheon, a pinto, named Diablo. 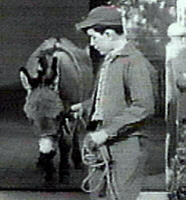 "Pancho" and his horse Laco was the Cisco Kid co-star on one of the horses used in the series. Both had numerous publicity photos on the horses. Television commercials - advertisement promotions for bread, and grocery stores and other businesses and of course a fan club with more toys and collectibles. Tornado was actually a beautiful seven year-old quarter horse named Diamond Decorator. It had won the Grand Nationals Medal Class in the 1950's with fourteen consecutive show wins. 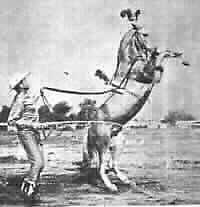 On the occasions when Guy Williams (Star of Disney's Zorro) would mount Tornado for a trot, parades or for publicity shots Diamond Decorator was used. Carson & Trigroy Trigroy was another off spring from the famous Roy Rogers horses. 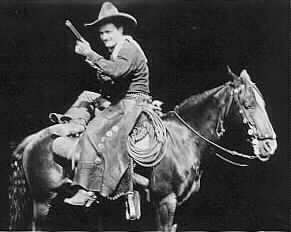 Buss Carson performed trick riding at the rodeo shows in the 1960's. Trigroy is the son of Trigger Jr. He has thrilled many audiences with his rearing and dancing tricks. The Carsons raised him from a colt. The man most famous for his association with Nautical is Hugh Wiley, a former star of the U.S. Equestrian Team's show jumping squad in the 1950s and ?60s. Cancer claimed Mr. Wiley on Sept. 3, 1999. He was 72. Mr. Wiley with Nautical, won the team gold medal at the 1959 Pan Am Games, finished sixth in the 1958 European Championships, and finished sixth individually in the 1959 European Championships. It was with Nautical (previously named Injun? Joe) that Mr. Wiley is most remembered, in part for their starring role in the Walt Disney movie The Horse With The Flying Tail. Olympic teammate - William C. Steinkraus was the first US equestrian gold medal Olympian of show jumping also rode Nautical and wrote books on the subject. by Walt Disney Productions, Buena Vista The name was fitting for this horse whipped that tail up at every jump and everyone would remember the flash of the tail was always Nautical.This was the story of the life of the horse they called Injun Joe and the Equestrian Olympics. The story is true. The horse was going to be destroyed when he was rescued and became part of the U.S. Olympic Equestrian Team. A palomino jumper who escaped from every corral they would put him - even seven feet high. This movie won the Academy Award for "Best Documentary Feature Film" in 1960. Dr. William Key. 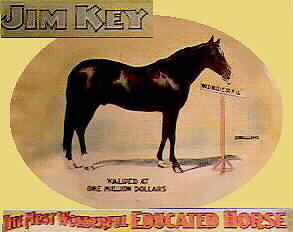 Jim Key was the most wonderful educated horse in the world and was valued at one million dollars. He performed the tricks he was taught to count, do math, and spelled. He appeared at the 1904 Saint Louis, Missouri Worlds Fair celebrating the Louisiana Purchase. The show that made the most money on the pike at St. Louis. An article about them was written in an old Cleveland, Ohio newspaper. 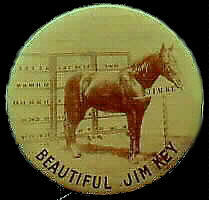 Souveniers of this famous horse included - buttons, post cards, photos, statues, and pamphlets. 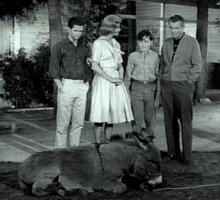 Leave it to Beaver TV series had this burro named " Pepe "
on an episode called: "Three Boys and a Burro"
The CBS 50th anniversary special introduced a "New Mister Ed", an anonymous palomino, who talked just like the original good old Mister Ed. Photo in the set used for the Nanny television series of `1990's, starring Fran Drescher. Remembering the best TV shows of all time. The human co-stars have shoe prints but no equine HOOF prints! 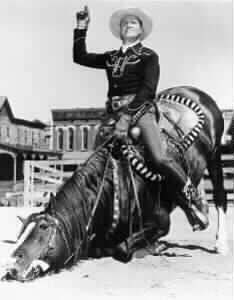 The Breyer Plastic Molding Company has made reproductions of Dale Evans and Roy Rogers horses -" Butttermilk " & " Trigger " also Gene Autry's horse - " Champion " all with an added video tape. Note: Susan writes for mules and more, a national mule magazine "Mules and More"
Joe Cragmile worked in the business for over 30 years and worked with Glenn and Corky Randall, Hutkins Brothers, Bobby Davenport and all the trainers. His wife Bev used to exercise Buttermilk (Dale's horse) and was on (Roy's horse) Trigger when Glenn was teaching him to high rear. 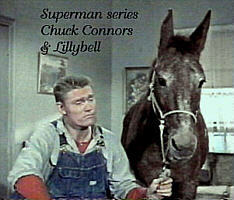 The mule was named Lillybell. 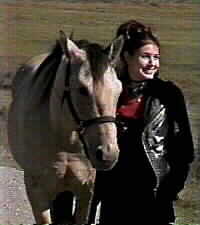 New for TV cable in 2000 on Nickelodeon is the series called "Caitlin's Way" with the buckskin horse called " Bandit &". The horse is an original wild mustang discovered in Canada who showed potential talent and was choosen for the show. It is filmed in Alberta, Canada but the story line is to be set in Montana. Graham Ware is behind the scenes horse wrangler on the show. Kirt Jarrett is the stunt co-ordinator. Reminds me of the Fury series but Bandit doesn't have as big of part. The real horses behind Bandit: Tatzee is the main star horse that is used for the close ups and tricks and Buck is the horse who does the running rearing and at liberty open range shots. Owner / trainer of the horses is Dusty Bews He is animal coordinator also his cousin Michelle Bews is the horse trainer for the series. She and her horse Jamie have done stand in jump scenes. Peter Bews is also involved in stunts with the horses. All related to Canadian Professional Rodeo Hall-of-Famer Tom Bews. The family have been doing stunts and training the animals for many years. 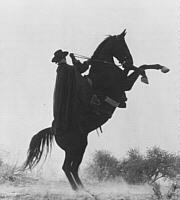 The horse that Ashley Wilkes rode off to the Civil War on in Gone With the Wind was a rather famous 3-gaited Saddlebred show horse by the appropriate name of "Anacacho Rebel". Most of the other horses in the movie were ASBs as well. "Rebel" was trained before, during, and after the movie by my trainer, Bob Lewis now 84 years old (1999). 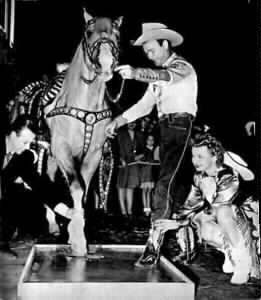 After his movie stardom, "Rebel" became quite the poster boy for horse shows ... e.g. "come see the "Gone With the Wind" horse." (b) our breed gets an inordinate amount of "bashing" from other breed folks that our horses are flighty, etc. 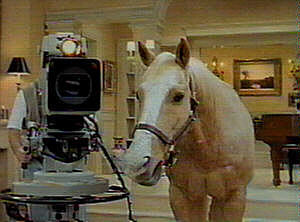 It takes a mighty calm and intelligent horse to be a star in the movies! The horse that was "Fury" was also an American Saddlebred. All information listed on this site are for educational purposes. Horse Fame is a free non profit service for the public. Horse Fame does not benefit from any links or organizations listed. HORSE FAME , established 1997.